Today was a surprise for everyone (but me). It was fun to keep it that way. Every time my Uncle Ted kept all the secrets about expeditions in past years, it frustrated me to no end, but now I understand how much fun it is. I think the team enjoyed it too. We started out at the giraffe feeding centre where the team went up and fed giraffe’s one pellet at a time. A bunch of us even kissed a giraffe! (Or more accurately, put a pellet in our mouth and fed it to the giraffe). I was surprised by how course his lip (?) was, and then I felt his tongue on my chin….wet, slobbery, and textured. So gross but I suppose it is Valentine’s day. They we went to the Elephant orphanage. Keilah thought the elephants were too big for their age. “They were 7 months old and so big!” She added that the person talking about the elephants knew so much about each of the 29 orphans. As the elephant walked by, I got to touch it, and was surprised at how course and hairy it’s skin was. I didn’t expect to find long black hairs and expected rough skin, but this was more like dried, cracked earth than skin. We climbed into the combi (our van that holds all 8 of us) and headed north towards Castle Forest Lodge. Janelle called it ‘The most beautiful place, in the middle of the forest, like an oasis’. You drive down this little terrible road. The waterfall nearby and solar panel showed that you can live in the middle of nowhere and bring in everything you need. Angie appreciated that there are way more stars in Africa then at home, with the unobstructed view at Castle Forest. Brady thought the view of Mount Kenya was stellar. We had our traditional team meeting as the sun set, each sharing why we decided to join this expedition, and the feeling was palpable, that we had now become a team. We had a nice meal and went to bed happily full of chapatti (my favorite Kenyan food – something like a fried tortilla). 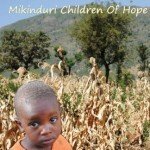 That night we finally arrived in Mikinduri! It’s Sunday and we left on Thursday, but we’re now refreshed and ready to have a great 2 weeks of working hard to help the poorest of the poor. On our journey to Mikinduri, we passed tea and coffee fields, rice patties, and the equator. (Cool!). Peter had his first haggling experience, trying to talk a person out of a bookmark and frame, for less than $50. When the person took 300 shillings off (a few dollars) for the friends discount, Peter realized ‘we were not that good of friends’. The Tour Guest Hotel (or as we Islanders call it, ‘the Inn on the Hill’), has stone buildings, similar to barracks, with 4 rooms along 3 rows, and a shaded seating area. In our rooms, Brady was surprised that ‘the toilet and the shower are in the same location’. Keilah dislikes that there is only a curtain in front of that ‘bathroom’ separating it from the 5 ft x 8 ft bedroom that contains a bed, table, chair, and sink. I would like to say that Peter has since remembered to use his mosquito net, but apparently not. He is too tall for the bed and still trying to figure out a good system. I’m trying to locate my bag from the Nakumatt (similar to Walmart), but to no avail, so I will be without my diet coke and macadamia nuts. We’re looking forward to tomorrow to get started!